Essence Recap! Finally..... — osojazy. · Black Girls are Magic. We are magic. I love to see so many black people together in one place enjoying life. · I kinda ended up waiting last minute to get my lewks together! However, this was literally a blessing! Zara (my favorite store) was having their annual sale. I got sooo many things at amazing prices. H&M, I know we aint supposed to be playing with them, but they had a sale as well and I got some great pieces also! CHEAP! · All those poppin’ restaurants you heard about? Yeah, there’s a 3hr wait. Just plan to wait everywhere good period. I really wanted to hit Neyows while I was down there but the wait was 3hrs and it just wasn’t happening. I definitely need to get back down to NOLA so I can get that good food when everyone else is at home and the lines aren’t out of control. · Everything I ate was delicious. Like so good. That is all. If you aren't a seafood person I'm not sure if NOLA is for you, I did have some bomb chicken but really its all about the seafood. · As I mentioned up there in my intro, I would recommend putting your phone down and being in the moment. Maybe I am getting old but I feel like everyone had their phone out recording the concerts instead of actually watching them most of the time. So they were missing everything going on around, I guess that’s a rant for another time, another place. · GO TO THE SUPER LOUNGES! I got some of the best performances in the Super Lounges at Essence. My personal fav performance I think was HER. She was really good. I think I enjoyed those performances more than the ones I saw on the main stage, which brings me to my next point…. · If I could do one thing different, I think I would not go to the concert all three nights or I would invest in better seats for the night when the person/people I REALLY wanted to see on the mainstage were performing. · Get a hotel somewhere within walking distance of the Superdome and Bourbon. We stayed at the Moxy. Cute little boutique hotel that enabled us to walk to the Superdome each night. We could also walk to Bourbon Street and pretty much anywhere else in the French Quarter. · A big thing that I learned this year in going is that Essence is really two things, in separate places throughout the weekend. So there are the things that happen at the Convention Center, which I never made it to. Then there are the concerts, which I attended every night. In addition to those two main things there are all these other like networking, and empowerment events going on! Like the E-Suite, which I attended on Saturday. · Somebody is gonna be mad about this one, but I had Café du Monde, and I don’t think my beignet was as good as the beignet that I got from the Beignet Café on Bourbon St. IDK why.. maybe because I didn’t eat them right away, but even my reheated beignet from the Beignet Café was delicious. · Invest in Experiences! I spent a little extra to go to the E-Suite, which was a panel, networking event. In that event I learned about the Honey Pot Co, from the founder who spoke on a panel. Also, Mented Cosmetics, they were on a panel. It was just a hub of networking and information. Which led to my TOP ESSENCE MOMENT! 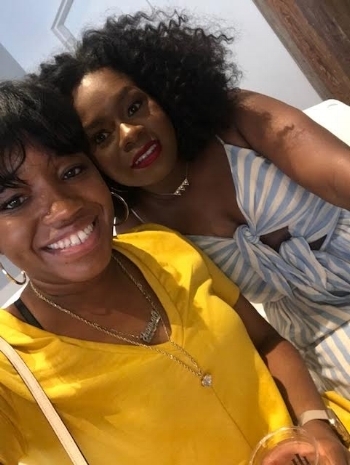 · I MET MYLEIK TEELE and sat and had a conversation with her about Bougie and the Budget, I was able to talk to her about how I was feeling a bit of imposter syndrome in starting a blog about personal finance when that wasn’t really my expertise, and she reminded me that someone needs to know what I know. Also gave me the advice to keep going even if it isn’t perfect just keep going! *I die a little just thinking about it* I was so nervous talking to her, I felt like a complete creeper. It was a weird experience for me personally, because I felt like I didn’t have anything to talk about or that I wasn’t interesting enough. Which brings me to one of the points that Myleik made in the past on her podcast about being well rounded and exploring information that isn’t necessarily your particular interest just to be well rounded and to be able to hold a conversation with different groups of people. She mentioned before how she had researched wines and she used that to start conversations. Definitely noted. · I also met a local woman at this event that has started a beauty concierge service called Beautify Nola! Check out her site here. She’s a mommy entrepreneur trying to change the game. We need more women like her! · Overall, I had a great time. I definitely want to go back with my squad and party a bit more. However, I wouldn’t change anything about this first experience. I would do it all again. Want some tips on how to get there? Check out this post over on Bougie and the Budget!